At Chaar we focus on the family dog and set goals that are worthwhile and easily attainable. Our humane methods can help create a well-behaved companion that knows not only basic commands, but life skills as well. You’ll learn a lot in our small, personable classes. Our flexible schedule makes it easy to find time to train and our trainers are available to answer any questions you may have. What methods do we use to train? There are so many methods you can use to train your dog and many opinions on what’s best and most effective. At CHAAR we believe in a positive motivational approach.  We teach owners how to set their dogs up for success and reduce mistakes. By repeating and reinforcing in a positive manner we develop quick responses, instill confidence and nurture intelligence. This creates strong bonds between pet and owner out of respect and pleasure rather than fear. The whole family - anyone who will be actively handling and training the dog at home should attend so everyone is learning how to train the same way (children must be 10 years or older and have approval by the Trainer to participate in class). Regular collar, 4' or 6' leather or nylon leash (no retractable leashes, choke chains or choke leads). 2 - 3 flavors of small, soft training treats and treat pouch. Comfortable footwear (no heels or sandals). We also recommend bottled water for yourself as you may be quite active during class. Owners wishing to clicker-train their dogs may also bring a clicker but we do not require them. For: Puppies 4 weeks - 5 months old. Get your puppy started on the right paw. This class covers key learning stages to help nurture a positive, up-beat personality in your pup. Socialization and exposure to obstacles and challenges allow your puppy to take on new experiences in a positive and controlled environment. Learn how to get and keep your puppy's attention, start them in basic obedience, calm them down, and teach them good manners & doggie etiquette. Common puppy problems such as housebreaking, rough play, barking, jumping up, chewing, biting, recalls, and many other topics are addressed in this class. 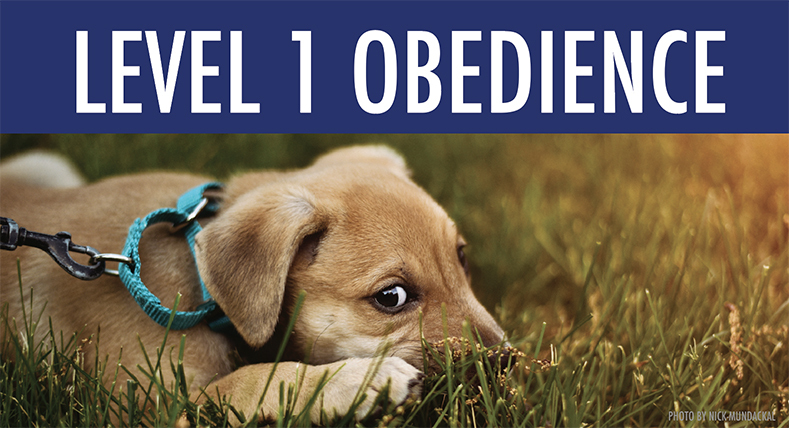 This is NOT an obedience class but will touch upon methods used to start your puppy learning commands. 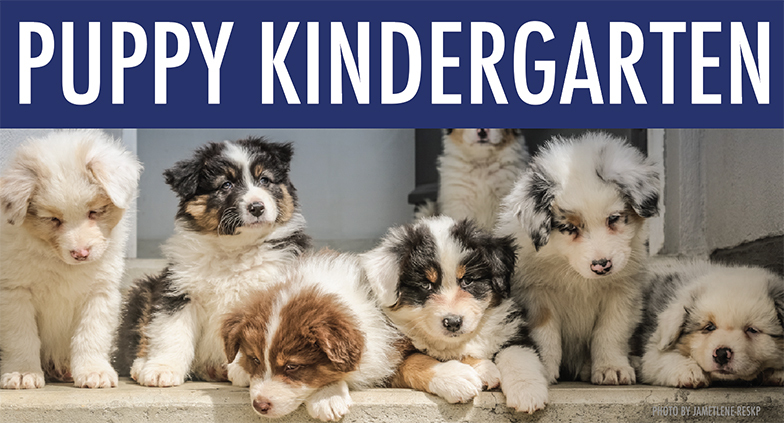 First-time puppy owners and new adoptees/rescues are encouraged to sign up for our Head Start Program. For: Dogs 5 months or older. 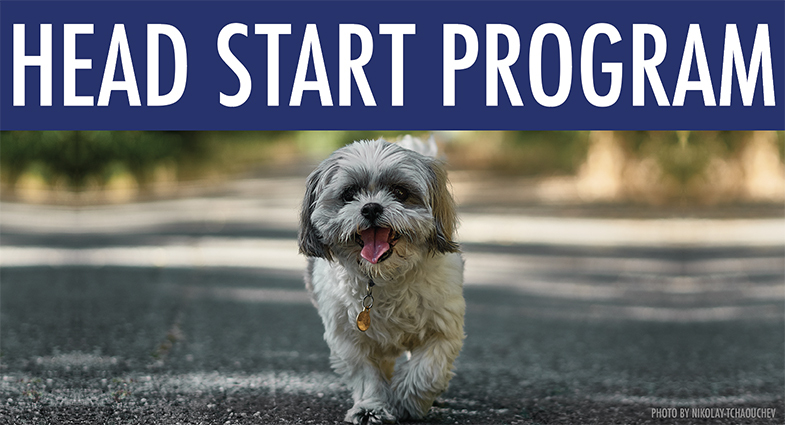 First-time dog owners, owners of new adoptees/rescues, or dogs with specific behavioral issues are encouraged to sign up for our Head Start Program. For: Dogs 5 months or older. No pre-requisite but a good sit-stay is very helpful! 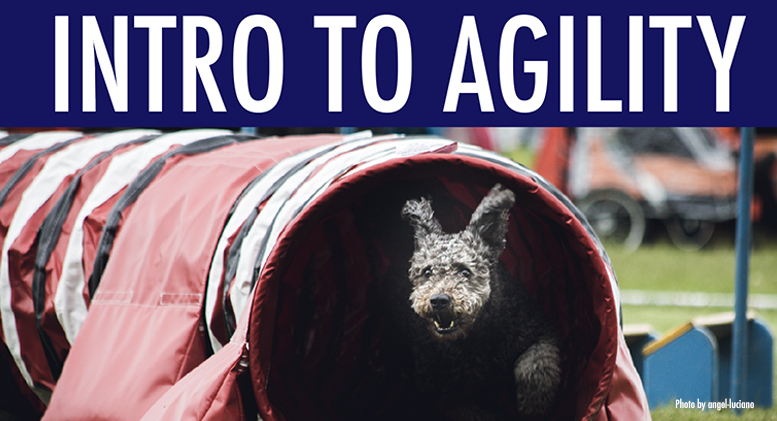 Introduce your family pet to the fun and exciting sport of Dog Agility! Our systematic approach is perfect for beginners looking for an engaging energy outlet for their dogs and provides a perfect continuation for dogs that have completed our Level 1 Obedience course. We use modified Agility equipment (approximately half the size of competition equipment) and break down the obstacles on-leash to make it easy for owner and dog to learn their way through to a full course. Obstacles include: jumps, hoops, tunnels, weave poles, A-frames, tables, teeter-totters, dog-walks, and more! Interested in Competition Agility? Ask about our Advance Agility lessons! For: Dogs of all ages and breeds. Duration: Scheduled at your convenience. Price: $200 for 2 one-hour private lessons. Work on issues specific to your situation. New puppy or adopted dog owners can benefit from getting a Head Start on training before joining a group class. 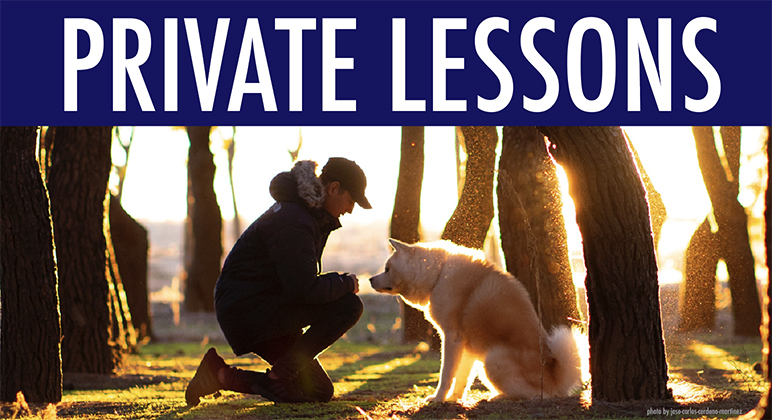 Bad habits such as jumping up, barking, chasing, nipping, rough play, fear & aggression, stealing/chewing, housebreaking, leash pulling and more can be addressed in private lessons. Great for owners with busy schedules that can't make the scheduled group classes. For owners wanting to start right away or need a little extra help getting started before joining a group class. Help your dog get a head start on his training and be two steps ahead of everyone else! Great for dogs that need extra attention outside of group sessions. For specific training situations that cannot be replicated in our classroom. 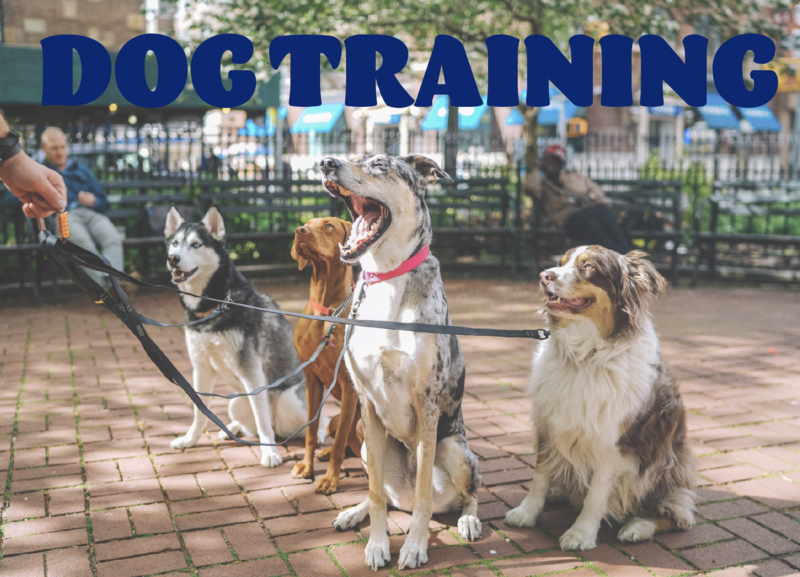 Have questions about dog training or want to sign up? Call 610-437-9978 for more info or contact us using the form below.